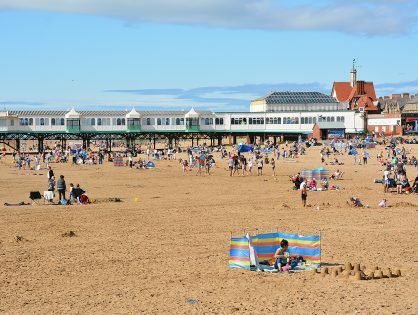 You’ll find St Annes Pier in the attractive seafront surroundings of this quintessential British coastal resort.  You can’t miss it, head from the high street in a straight line towards the sea and it’s straight in front of you! 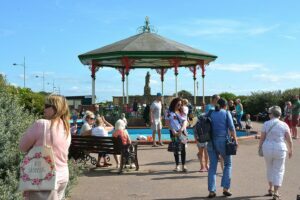 Close to the pier is an attractive bandstand, Victorian shelters, and the sea front gardens. They include a pond and waterfall, complete with resident ducks, and even a grotto! 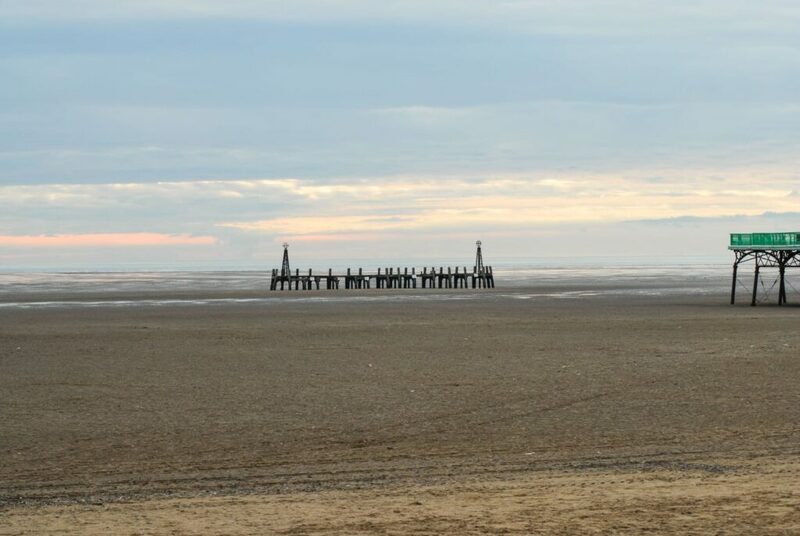 St Annes Pier was originally opened to the public in 1885 at a cost of £18,000. It was one of the earliest public buildings in St Annes. It’s built in cast iron with a wooden deck and includes shelters and pavilions in cast iron, glass, and wood. When the Pier was new, you could catch a steamer to Blackpool or Liverpool. Later on, the channels in the Ribble estuary were dredged and changed to improve access to the docks at Preston. This left the Pier high and dry and ended the old steamer service. Like most piers of the time, it started life as a sedate promenading venue. The attractions were added later, along with the Tudor style entrance, which was built in 1899. In the early 1900’s a Moorish style pavilion followed, then in 1910 the Floral Hall. After that, in 1954, the amusement arcade was added at the entrance. English Heritage recognised it’s importance when they designated it a Grade II listed building on 21 September 1973. In 1974 the Pier survived a major fire which caused serious damage to the hall. However, it was a second fire in 1982 which destroyed the Floral Hall. The Pier was originally 914 feet long when it was built, but after the second fire half of the pier was demolished for safety. After demolition of the seaward end it was reduced to 600 feet. You can still see the very end of it today, as the remains are a much photographed feature of the beach. 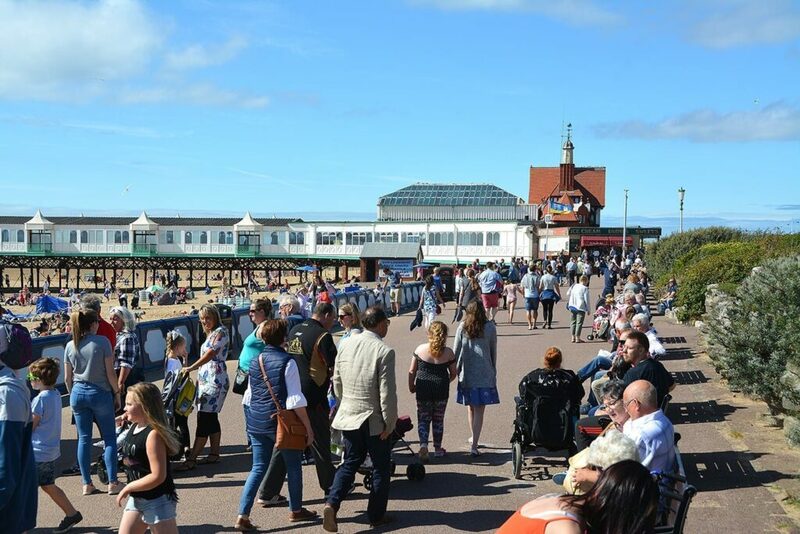 In December 2018, St Annes Pier won a £50,000 share of the Coastal Revival Fund, which supports the restoration of historic buildings and coastal assets. Assistance with restoration of the structural steelwork. Paul Drinnan is the Regeneration and Design Manager at Fylde Council. He said “We are delighted with the award of this grant and this is totally warranted. 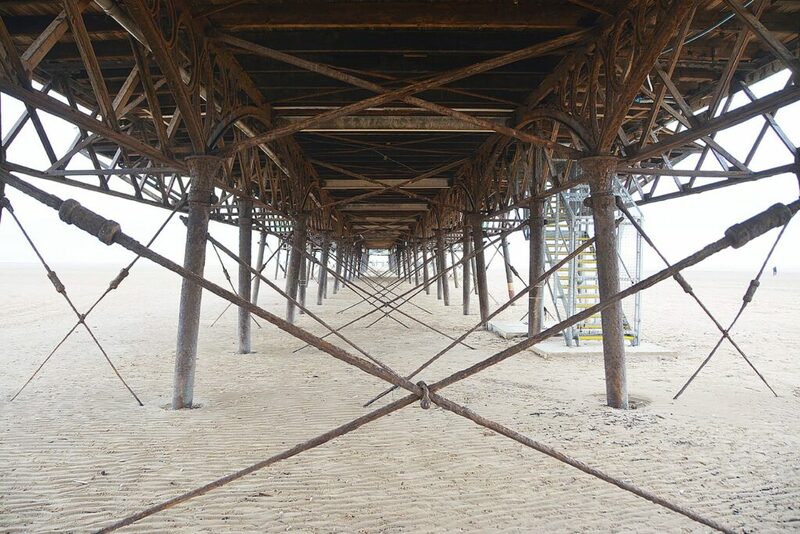 The trustees of the Pier invest significant sums of money to keep the Pier in a good state of repair, much of which goes unnoticed since it relates to the structure of The Pier. The Coastal Revival Fund is now in its third year. It provides grants to coastal heritage sites for repairs and restoration. 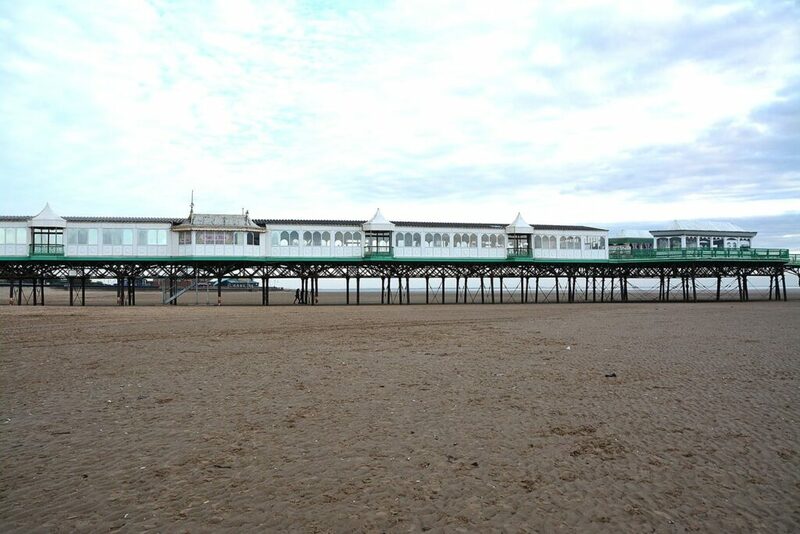 St Annes Pier is one of 25 successful bids from the 123 which were received. In 2010 a scheme to make the Pier more attractive and illuminate the town at night saw new lights added to the front of it. Then in 2012, Fylde Local Strategic Partnership provide £75,000 of funding for illuminated columns, new surfacing and ornamental bollards for the front entrance and forecourt. 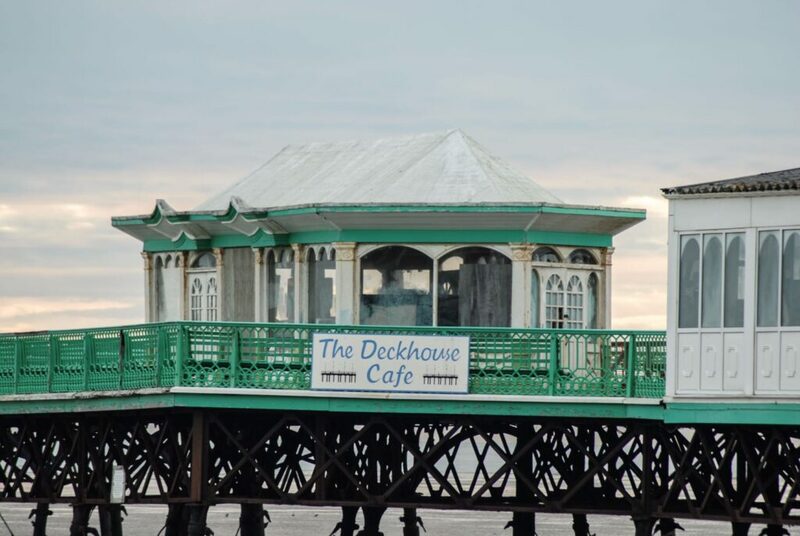 Also in 2012, after work on one of the pier’s pavilions, the new Deckhouse Cafe opened at the end of the pier. This was the first new business to open on the pier for 38 years. 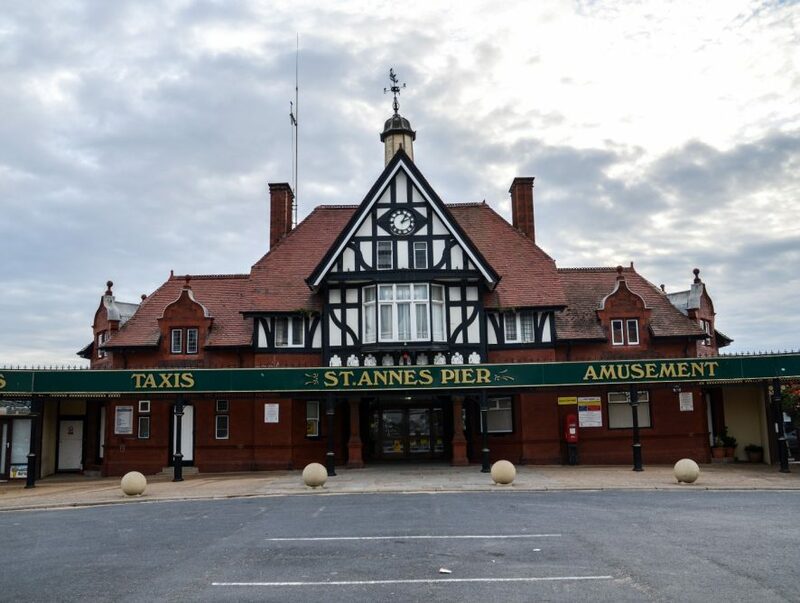 St Annes Pier Company Ltd is the private owner of the Pier. 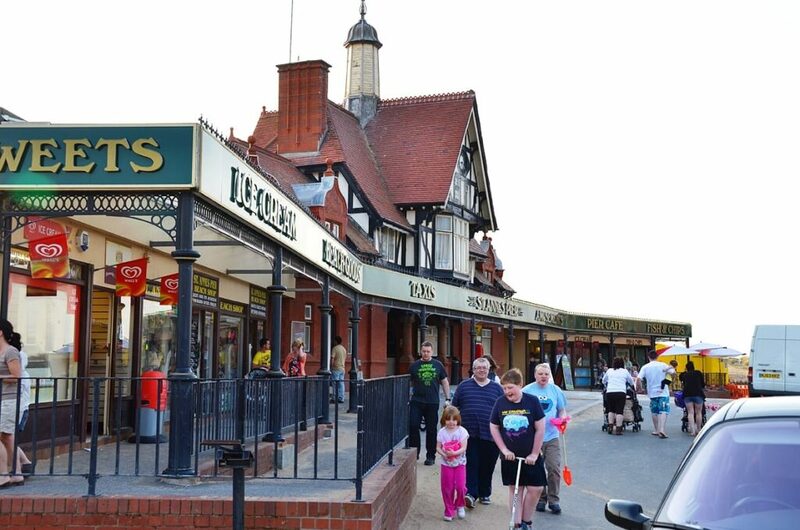 The seafront at St Annes around the Pier is well provided for with the facilities of everyday life. There are toilets, car parks, cafes and ice cream kiosks. All through the year it’s a lovely spot for a walk. In winter it’s bracing and in summer it’s the delightful English seaside at it’s best! There’s pay and display parking in the vicinity of the Pier. There’s a car park on the forecourt of the Pier and another one to the right of it. You’ll also find free parking along the highway at the promenade. 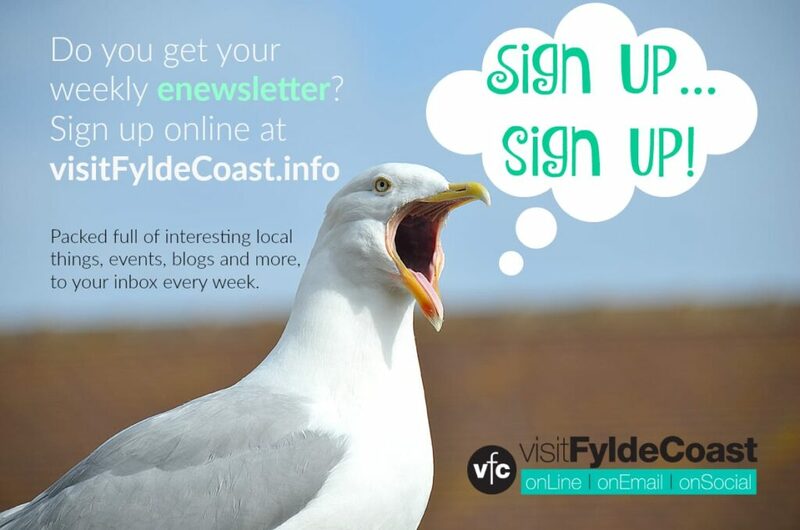 Danfo is the company who look after public toilets on the Fylde. They are individual cubicles, coin operated with a 20p piece. There’s a block of toilets at the right of the Pier forecourt and another block to the left, just past the paddling pool. There are other toilet blocks along the seafront. Those who enjoy walking will enjoy the seafront footpaths, along which you can roam around the coastline. An inner promenade footpath follows the edge of the beach and of course the pavement runs along the edge of the highway. 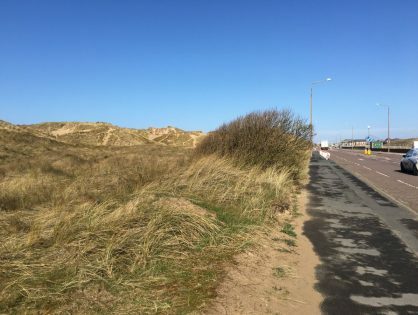 Head south and walk past Fairhaven Lake and onwards to Lytham, or head north towards Blackpool and all that lies beyond. 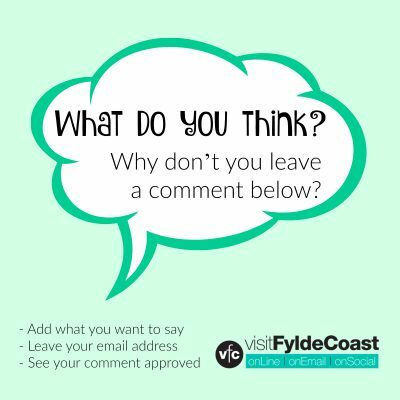 You could even (if you wish) continue along the edge of the coast to Fleetwood.